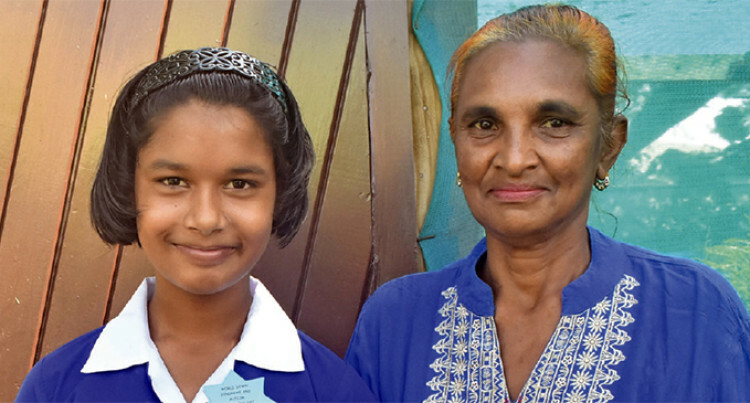 Shaiba, a Nadi Special School Year 4 student, suffered a dreadful disease when she was nine months old and it has affected her ability to hear and speaking abilities. Despite her granddaughter Shaiba Nuraiya Far­adth’s condition, Samsun Nisha manages her monthly social welfare money to take care of her. Life has not been good for the 12-year-old after her parent was separated, but the generosity of her grand­mother Samsun, who faces all challenges to take care of her, is what keeps her going. The Fiji Sun News team spotted the two during the Down Syndrome and Autism Celebration at Nadi Spe­cial School that was officiated by the Minister of Edu­cation, Rosy Akbar. Mrs Nisha shared challenging stories about the strug­gles she endured to take care of her family. “I brought my granddaughter from Suva because of the state she was in. At a Hilton Special School in Suva I learnt that she was being looked after by a teacher who fed and look after her every day. I am really thank­ful to this teacher for looking after her,” she said. “My son got married again and I decided to bring her to Nadi and look after her. I had a daughter who left school and hasn’t got a job yet.